This guide shows you how to install a Chromium web browser, which should be faster and more reliable than the standard Debian web browser. A Debian Squeeze SD card for the Raspberry Pi, size should be 2GB or larger. Note: currently Chromium only works on the older Debian Squeeze image. It is not supported uptream for Debian Wheezy. Midori is still recommended for Wheezy. Suitable for absolute beginners. No Linux knowledge is needed. It is assumed that you have used a computer before, for example a Windows PC. Enter the following command and press enter at the end. Wait for the desktop to finish loading. Click on the LXDE icon (the strange X) in the bottom-left corner of the screen. Move your mouse to point to "Internet". Click on "Chromium Web Browser". 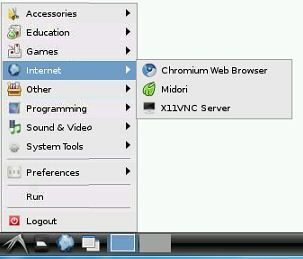 The Chromium web browser will open. This page was last edited on 30 March 2013, at 14:31.